Is Press advertising worth it? This is a question I am regularly asked by clients, particularly because advertising in newspapers, compared with some of the other online and offline advertising opportunities that now exist, can be expensive. Do you sell direct to customers? For newspaper advertising your target market should be consumers. If your target market is businesses, you need to look at trade publications. Do you have premises for people to visit or is your business fully online. If it’s online, newspaper advertising may not be for you, unless they offer advertising on their website. It’s important that you do some homework to help you decide which publications are best suited for advertising your business. Most publishers give details of their circulation numbers and prices. You need to weigh the opportunities up before making an informed placement decision. 3. Do you operate locally or nationally? This will inform which newspapers you consider placing adverts with. If you look at local papers you do see national advertisers, but they have placed these adverts in the belief that there is a strong local demand for their product or service. Can you afford to pay for daily or weekly adverts depending on how often your chosen publications are printed? 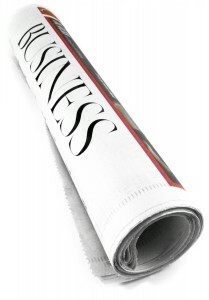 Newspaper advertising is MUCH more effective if your advert is regularly seen. The ability to offer a good deal on current stock, or a percentage off a particular service will make your advert more appealing. It’s worth also planning ahead for seasonal opportunities. 6. Can you meet the demand an advert might generate? You may have heard horror stories about companies advertising on voucher sites and not being able to supply the goods offered at a discount price. Whilst I wouldn’t want to excite you by saying your advert might generate huge business for you, it is something you need to bear in mind. 7. Have you exhausted all of the free, or less expensive alternatives? Because it is expensive, I usually advise clients to try other alternatives first. Particularly for new businesses, there are a number of lower cost online and offline options to consider and try before looking at paid press advertising. 8. Do your main competitors advertise regularly? If they do, then you may feel that you need to do the same to compete. If they don’t, advertising yourself might give you an advantage. 9. If you are already advertising is it working or you? It’s important to measure the success of your current advertising to ensure you are getting value for money. Take steps to find out where customers heard about you. Stop your adverts for a month to see if it makes any difference to your customer take-up. Make informed decisions about how you promote your company to ensure the best use of your marketing budget. If you haven’t advertised in the press before – give it a try, but be aware that you will need a sustained period of advertising to maximise your chance of success. For a daily publication you would need at least a month, for weekly 3 months and for monthly 6 months to ensure that enough of your target audience has seen your advert and/or can recall it. Little Voice can help you with your advertising and marketing strategy, contact us today for a free consultation.